Steve Hamilton is still remembered for his Folly Floater pitch, and his Yankee teammates will never forget the time he swallowed some of his chewing tobacco and threw up on the mount. Abby came to the Yankees in a 1963 trade with the Washington Senators, so he was there when I made the team in 1966. We met at spring training. We were Yankee pitchers together until the last month of the 1970 season, when the let him go and the White Sox claimed him off the waiver list. We had fun together, were friends off the field, and stayed in touch until he passed away of colon cancer at the young age of 63. One of the coolest facts about Abby is that he also played in the NBA for two or three years; I think only two guys have ever played in both a World Series and in the NBA finals. The dude was 6’6. I remember that Carl Yastrzemski couldn’t hit Abby; he had a career .143 batting average against him. If I had to pick one guy to get out, it would have been the best player for our biggest rival. There was one game in 1970 against the Red Sox that I remember well because I was the starting pitcher. It was June 21 at Fenway Park. We were in 2nd place in the AL East, 3 game behind the Orioles, and I was having the best season of my career – soon afterwards, I would be named for the first (and only) time to the American League All-Star team. The game started off well enough, a 1-2-3 first inning. But in the bottom of the second, I wasn’t throwing well. Tony Conigliaro led off with a single, and moved to third on a one-out single by George Scott. I struck Billy Conigliaro out, but then Jerry Moses hit an RBI single. Then George scored on a single by the Red Sox pitcher, Gary Peters. Jerry scored off a single by Mike Andrews. We were down 3-1. Yaz led off the third with a single and Ralph Houk had enough. I was out, Ron Klimkowski was in. The lead bounced back and forth a few times. The Major pulled Ron in the sixth for Abby, who walked Yaz; then Jack Aker came in to pitch. Long story short, Yankees won 14-10 in an 11-inning game. Bobby Murcer led us to victory, robbing Yaz of a Home Run in the eighth with an incredible catch, and a key double in the top of the eleventh. Here are the ones I should have led with: two 1970 games against the Brewers at Yankee Stadium. On May 2, I started the game and had a 4-0 lead going into the sixth inning. John Kennedy, a former Yankee, led off with a single to center. I struck out Rich Rollins, walked Tommy Harper, and John scored on Ted Kubiak’s single. I struck out Ted Savage; then Kubiak stole second and Tommy stole third. I walked Danny Walton, loading the bases. Mike Hershberger hit a two-run single to center, and The Major brought in Lindy McDaniel to pitch. I left the game with a 4-3 lead. Milwaukee scored two runs off Lindy and Jack Aker in the eighth, putting them ahead 5-4. Jerry McNertney hit a leadoff homer against Joe Verbanic in the ninth (6-4) and then loaded the bases with two walks and a single. The Major brought in Abby, who struck out the next two batters to end the inning. This game ends the way I like them to end: Bobby Murcer hit a two-run homer in the bottom of the ninth to tie the game, and with runners on first and second, Thurman Munson hit a walk-off single to win the game. Abby got the win. The next day, May 3, the first game of a Sunday afternoon doubleheader, starter Bill Burbach and reliever Ron Klimkowski gave up a combined 5 runs in the first three innings. The lead bounced back and forth for a while and in the sixth, with the Brewers ahead 6-5, Abby came in to pitch. He gave up another run after Kennedy doubled, Bob Meyer bunted him to third, and Tommy Harper got an RBI sacrifice fly. The Yankee offense came through for Abby in the bottom of the sixth Bobby Murcer led off with a single, but got forced at second by Roy White’s ground out. Heeba scored on Danny Cater’s single to left. Then Thurman Munson came in as a pinch hitter for Jake Gibbs and tripled, scoring Danny. That was followed by Gene Michael’s double, scoring Tugboat. Abby ended the inning with a pop up to the shortstop, nut the Yankees now had an 8-7 lead. I think this part is important: the fact that The Major let Abby hit with a runner on second and a one-run lead is a testament to Abby’s pitching. He was doing well, and they weren’t going to risk taking him out. Abby did not disappoint: he got out of the seventh unbruised, with just one base runner on a walk; he had a 1-2-3 eighth. And he won the game in the ninth with another 1-2-3 inning. It was great pitching – for the second time in two days. I’m going to try something called Monument Monday, as a weekly tribute to the Pitchers I knew during my baseball career. One of the greatest things about being a young ballplayer is that sometimes you get to actually play on a team with some of the guys you followed as a kid. 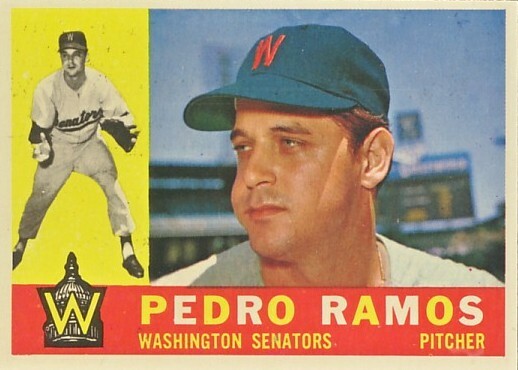 Pedro Ramos was a good pitcher and would have done better if he had played for a better team. But the Washington Senators of the mid-to-late 1950’s finished last in the American League for four of the six years he played there, so his stats don’t really do the man justice. He was in Cleveland for two years (another bottom half AL club) and came to the Yankees during the 1964 Pennant race. Always a starter, the Yankees used him in relief; I hesitate to call him a closer, because pitchers threw more complete games than they do today. During my rookie year, 1966, Pedro pitched in 52 games – pretty amazing for one guy to pitch almost 1/3 of the games — had a 3.61 ERA and struck out 58 batters in 89 innings. 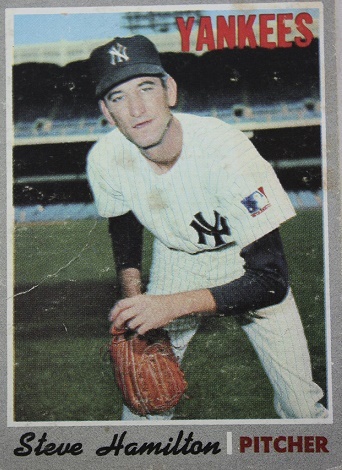 I think the first time he relieved me on the mound was on May 22, 1966, the second game of a double header against his old team the Minnesota Twins, at Yankee Stadium. I wasn’t pitching badly – I had only given up two hits before Tony Oliva tripled to lead off the 4th and Bob Allison hit a sacrifice fly to Mickey Mantle in CF, and we were losing 1-0. Elston Howard doubled to left to lead off the 8th and Hector Lopez pinch hit for me. Ralph Houk put Horace Clarke in to run for Ellie, and Hoss was able to get to second after Hector hit a deep shot to center. Hoss scored on Roy White’s single, tying the game. White advanced to second on Bobby Richardson’s hit, and scored on Joe Pepitone’s double to left. Pedro came in to pitch the 9th, got Rich Rollins to ground out, and struck out Sandy Valdespino and Russ Nixon. That was my third career win, a 2-1 victory over the Twins, and I’ll always be grateful for Pedro for that and for his friendship.